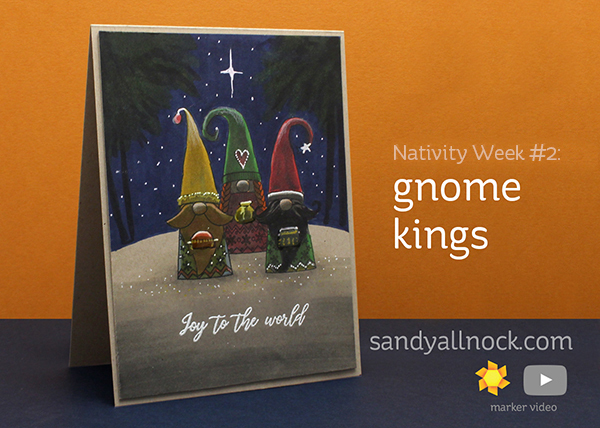 Today it’s the magi’s turn to take the spotlight during nativity week – and they’re so stinking cute! 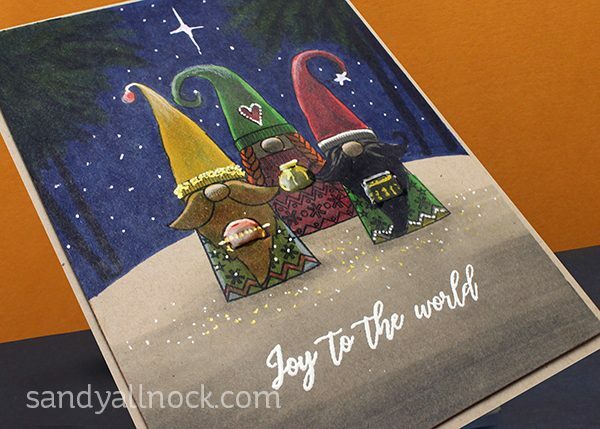 The two gnomes in this Reverse Confetti stamp set got me thinking immediately of the three kings. And thus I went there! I altered the stamps to make one look like a third stamp since there were only two, and added the gifts for them to hold. And of course the desert scene was all me! Watch the video below or click HERE to see it in HD on YouTube. 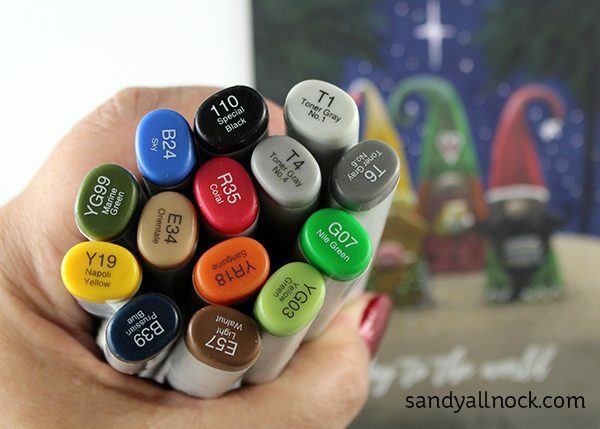 The trees in the background were so easy since they’re just a “hint” at a scene – you don’t even need to know how to draw to add some squiggles in the dark sky! Great card Sandy and I love it that you turned the gnomes in to the Kings, awesome! Thank you so much for showing. I don’t know what went wrong but I didn’t get my email for this post nor for the post from today (11-21), I thought I would let you know perhaps I am not the only one. Well-done video, Sandy. Was holding my breath when you added the T6 to the nice gnome colors, but it turned out great! Thank you for sharing your amazing talent! Funny little gnomes – and I never would have realized that the middle one was originally a girl – “gnomette”? Anyway, a really cute card – with lots of ideas for changing up the stamps, and I am getting braver at that, so thank you once again for all you do!